ADD $30/nt for AC. Cleaning $205. Please Notify Owner to adjust Quote prior to making a "Booking Request". Please read all "notes" in this listing. 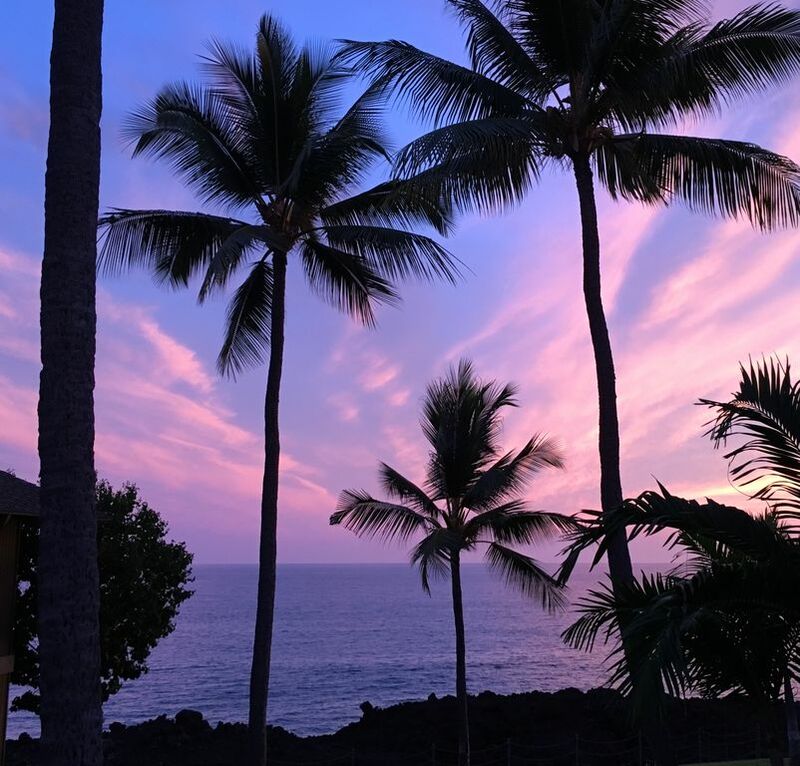 'SOLITUDE,' Tropical OCEANFRONT Kona Condo at the Prestigious 'Kanaloa at Kona' (gated). Walk to Kona Country Club Golf Course next door. 2000 square feet plus Private Lanai ON THE OCEAN, Vaulted Ceilings, Skylights, Koa Wood Kitchen. There are 4 porch stairs to front door. There are 12 stairs to main level. Loft/Office Suite also has 8 foot Granite Computer Desk, sitting area, table & chairs. Washer/Dryer, Fully Equipped Kitchen, Microwave, Jenn-Aire Range, Blender, Coffee Maker & Grinder. Walk to Keauhou Bay, Fairwinds II, Fishing & Diving Charters, Secret Cove and Kahalu'u, the Big Island's Best Snorkeling Beach according to West Hawaii Today. Walk to the Market, Movie Theater, Drug Store, Gift Shops and Post Office. 3 Pools (one is Oceanfront), Tennis Courts, Outdoor Hot Tubs, Gas Barbecues & Covered Parking (with plenty of visitor parking available). Please note: 'Solitude' is NON-SMOKING. HOUSEKEEPING: Initial cleaning is done prior to your arrival, cleaning fee $205 is charged upfront. Please enjoy 'Solitude' as you would your own place. There is NO SMOKING ALLOWED anywhere in the Kanaloa Complex. It is a smoke free zone. Iron Man Event & Christmas Terms: 7 night minimum. No discounts in 2 week window. Check in is 4 PM; check out is 11 AM. RESERVATIONS: We require an advance deposit of $500 within 7 days and notification of the exact dates of your arrival and departure. We need to know: how many people are in your party, your address and mobile phone number. This will confirm your reservation. Once confirmation is made, your balance is due 60 days prior to your scheduled arrival. The $500 deposit also serves as a damage deposit and will be returned within 14 days of departure. CANCELLATION: Your deposit is refundable if cancellation notice is given 60 days prior to scheduled arrival. No refunds of prepaid rent can be given if cancellation is less than 60 days of scheduled arrival date. Forced Air. $30 per day. May be locked off by request. COMPLIMENTARY INTERNET is provided, and we make every effort to keep it running smoothly, however NO REFUNDS will be given for connectivity problems. COMPLIMENTARY CABLE TV is provided, and we make every effort to keep it running smoothly, however NO REFUNDS will be given for connectivity problems. Nice pools, nice ocean view from condo. Has everything we needed for cooking, sleeping and lots of pool toys, games, beach toys! Even had ping pong table for the kids! Would definitely recommend for family. We had 7 adults and 2 young ones. Perfect! Watch and listen to the waves from your private lanai! The unit is large, comfortable and well appointed. We cooked in most nights after hunting and gathering at local markets. The large lanai was a perfect spot to enjoy our meal with an ocean view. There are three pools on site but we spent most of our time at the ocean pool watching the most amazing sunsets! The grounds are well maintained and check in was easy. This is a great place for families or three couples. Enjoyed the ocean view deck! Solitude had a lot of space for the 6 of us. The loft was great for the kids and having a bathroom in the loft was excellent for the kids so they didn’t have to come downstairs at night. The condo was really well stocked with all you need to enjoy Hawaii, including a cooler and boogie boards. The only downsides were the freezing cold pools- not heated, and the downstairs condo had guests with kids who we could hear quite clearly crying through the night and running back and forth through the condo early in the mornings. The deck has an excellent table set to enjoy the ocean view in comfort. The location is convenient with a shopping center very close by, as well as the great snorkel park. Downtown was a 10-15 drive. The view and pool was the best part ! Hi We spent a week here with our 2 single adult boys and one son with his girlfriend. And the 2 of us. Everyone fit quite easily. The condo is spacious and extremely well equipped from boggie boards, flippers, beach chairs and umbrella. The kitchen had everything we needed for cooking in home meals. The lanai looks out onto the ocean so thats alway nice to look at when Im sipping my morning coffee. There are 2 tennis courts , 3 pools and hot tubs. The ocean pool is right along the ocean. great view. If you are into downtown Kona then this is about a 15 drive downtown. Overall I would recommend this condo without reservation. PS. Dense and Joanne respond very quickly to inquiries about renting this condo. The complex was great with 3 pools and 2 tennis courts and well maintained grounds and adjoining golf course. We had a good position overlooking the ocean and had plenty of breeze and with just the fans going were very comfortable.